Every game features a premium store which sells bonus points (or unlock points for Scrimmage Football). The in-game currency is a higher tier than normally gained currency(generally $) and can be saved for purchases that cannot be made with the lower tier currencies. These often include membership boosts ranging from daily to monthly and also generating usable items ranging from lures to equipment to cards depending upon the game. Flash sales are a feature present in EVERY Red Shade Games product. Flash sales accumulate a pool of up to 40 bonus points. Every hour, 2 bonus points are added. Most games offer a “matured” deal when 16 bonus points are in the pool and you place an order of $37.60 or more. When an order is placed, it claims up to 16 bonus points(20% of the total bonus points purchased). An easy way to view the CURRENT flash sale pool is in the STORE section on any game. 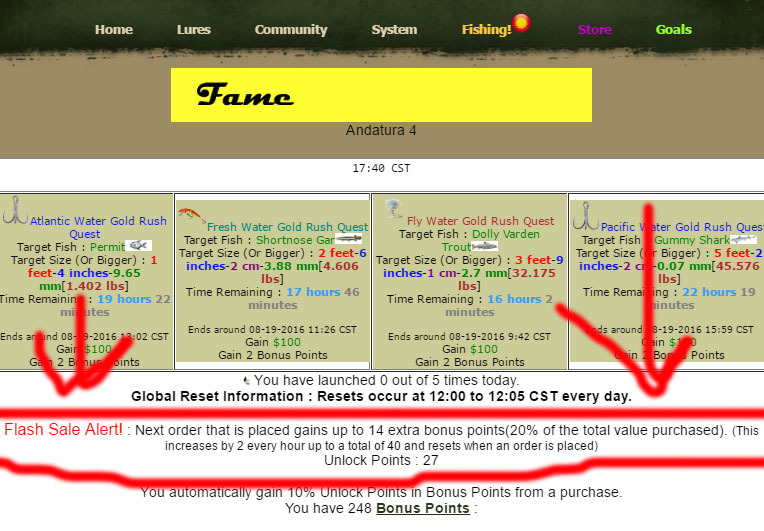 Below is a SCREENSHOT from Trophy Fishing Online 2's store page showing the CURRENT flash sale. All orders are processed in real-time by an automated system. You will receive your bonus points(or unlock points) within a small amount of time after submitting your order via Paypal. What is Paypal? Sales tend to happen around holidays. The standard rate is a 20% bonus to all purchases. You will gain 1 car card per bonus point purchased. These have a variety of uses from trading for IP, gaining non-production vehicles and even boosting a car in races. You automatically gain 10% Unlock Points in Bonus Points on Trophy Hunting Online or Trophy Fishing Online 2. These unlock points can be redeemed for specific lures or equipment depending upon the game helping balance possible bad generations with desired, specific items. These are known as Sponsorship accounts in most games and feature a 30 day time period. Most cost about $15 USD(decreased during sales) which averages out to about $0.50 USD per day. As administrator, I often recommend this items as one of the safe return investments for players who do not like risking generation of usable items but still want to get something useful. Grants a 10% bonus to “show girl”, “promoter” and “pit crew” on all cars. This sponsoship account also can accrue up to a day of entries at 0:00,8:00 and 16:00. Allows you to store up to 30 entries total. Base accounts cannot store past 15. Car Stables - Allows you to purchase 1 car from the stable per 24 hour period for normal price. Gives 4 randomly generated upgrade parts every “new car release”. Basically 120 upgrade parts for the price of 60 spread out over a month. +25% Show Girl Bonus/All Cars, +25% Promoter Bonus/All Cars and +25% Pit Crew Bonus/All Cars. Each of these are large 24 hour boosts for the cost of $2 USD(price varies during sales). They are exceptionally useful at advancing quickly through the game or racking up large generation odds on a busy day. This package was intended to help bridge the inconvenience of using many bonuses over the course of the weekend(Constantly having to refresh the bonuses) and also savings for those who have the capability of “binge fishing” during a 2 day period. As each cash-out has a value of “4 bonus points”, it is possible in a single 24 hour period to reach the value of this package. Every cash-out past that point is saving bonus points and it is possible to save 50% of more with many cash-outs and timing around the daily resets. This package is also available on Trophy Hunting Online as of October 21st, 2013. Player Bonus : Lure Saver You lose 0 durability when you finish casting as opposed to 1. You lose 1 durability when hooking a fish instead of the normal amount. You lose 0 durability when cutting the line while fighting a fish. You lose 0 durability when you lose a fish during a fish fight. Lose 5 instead of 10 durability when chased out by a dangerous animal. Lose 3 instead of 5 durability when you fire a weapon. Lose 3 durability on utility equipment instead of 5 on every use. 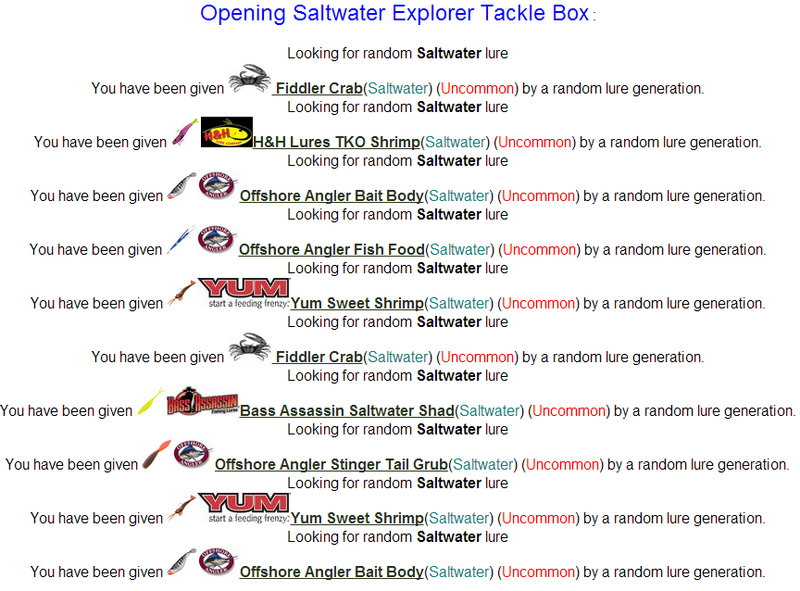 This does not use generation to determine rarity of lures. You are given a specific amount of each rarity with a 33% chance of each “water type”.